Why is Google routing the world through 'Googol'? Could this new domain have something to do with major upgrades to the Google's famously distributed internal infrastructure? Judging from DiBona's comments, it would appear not. In August, Google began testing a new search infrastructure dubbed Caffeine. Speaking with The Reg, uber Googler Matt Cutts confirmed that this new infrastructure includes a rewrite of the company's proprietary distributed file system - known at least informally as Google File System 2, or GFS2 - as well as other infrastructure platforms that could be applied across the company's back-end. In early November, Google said it had completed its Caffeine testing, and Cutts announced that the new infrastructure would roll out to a single data center sometime after Christmas. 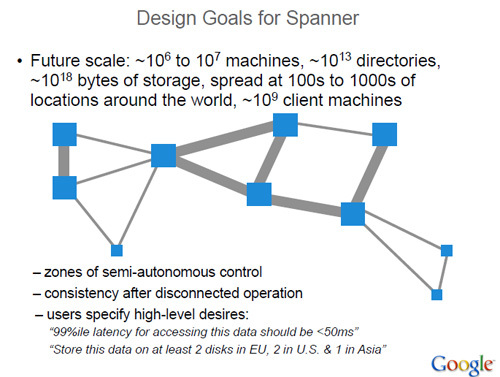 Google publicly mentioned Spanner for the first and only time during a distributed computing symposium in mid-October, around the same time it launched 1e100.net. Whatever Google is up to with this new domain, the company has launched it in typical Google fashion - on the sly and with a certain amount of geek humor. For those Wireshark-obsessed netizens, the mystery domain is causing a fair amount of confusion. And there's a certain irony in Google hinting that 1e100.net involves reverse DNS lookup. According to one poster to Google's Webmaster Central help forum, Google's FeedBurner crawler uses 1e100.net, which could make it difficult for some netizens to identify the crawler for what it is. "The FeedBurner crawler doesn't use the google.com domain in its DNS. I am seeing crawls from 74.125.44.136, which resolves to yx-out-f136.1e100.net. Now I get the joke, but someone else might not, and this doesn't seem to be documented anywhere," the poster writes. "Does Google plan to use this 1e100.net domain elsewhere, or is it just for Google's network ingress/egress points? If I want to validate the FeedBurner crawler, can I use it reliably with the round-trip DNS technique?" Clarity, in this case, has taken a backseat to an inside joke. According to Stanford University computer science professor David Koller, Google co-founder Larry Page brainstormed the company's name with fellow graduate student Sean Anderson during a meeting in their Stanford office in September 1997. "Sean and Larry were in their office, using the whiteboard, trying to think up a good name - something that related to the indexing of an immense amount of data," Koller writes. "Sean verbally suggested the word 'googolplex' [a one followed by a googol zeros], and Larry responded verbally with the shortened form, 'googol'....Sean was seated at his computer terminal, so he executed a search of the Internet domain name registry database to see if the newly suggested name was still available for registration and use. "Sean is not an infallible speller, and he made the mistake of searching for the name spelled as "google.com," which he found to be available. Larry liked the name, and within hours he took the step of registering the name 'google.com" for himself and [fellow co-founder] Sergey [Brin]."